Western Pygmy Blue Fall 2012 Natural History Butterflies first appeared on the earth during the Eocene epoch, 40-50 million years ago. They can be found. 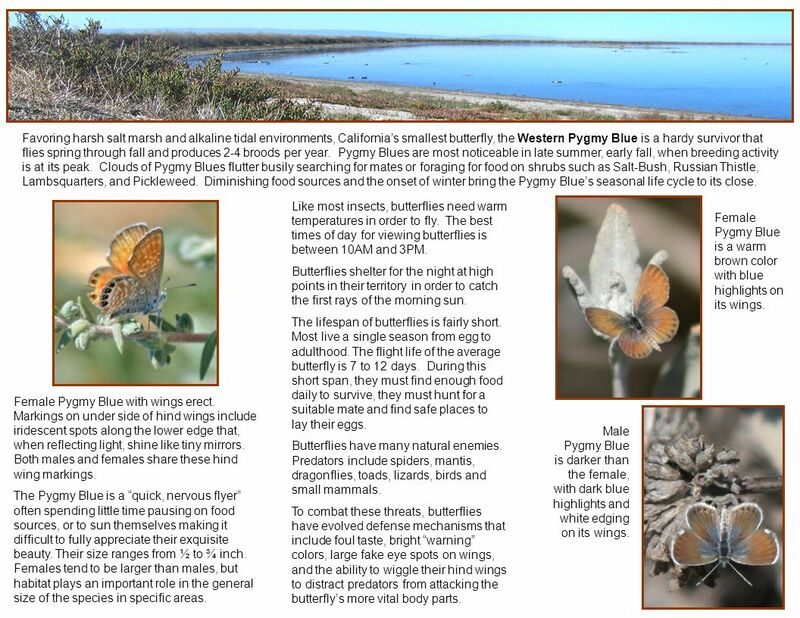 2 Favoring harsh salt marsh and alkaline tidal environments, Californias smallest butterfly, the Western Pygmy Blue is a hardy survivor that flies spring through fall and produces 2-4 broods per year. Pygmy Blues are most noticeable in late summer, early fall, when breeding activity is at its peak. Clouds of Pygmy Blues flutter busily searching for mates or foraging for food on shrubs such as Salt-Bush, Russian Thistle, Lambsquarters, and Pickleweed. Diminishing food sources and the onset of winter bring the Pygmy Blues seasonal life cycle to its close. Female Pygmy Blue is a warm brown color with blue highlights on its wings. Male Pygmy Blue is darker than the female, with dark blue highlights and white edging on its wings. Female Pygmy Blue with wings erect. Markings on under side of hind wings include iridescent spots along the lower edge that, when reflecting light, shine like tiny mirrors. Both males and females share these hind wing markings. The Pygmy Blue is a quick, nervous flyer often spending little time pausing on food sources, or to sun themselves making it difficult to fully appreciate their exquisite beauty. Their size ranges from ½ to ¾ inch. Females tend to be larger than males, but habitat plays an important role in the general size of the species in specific areas. Like most insects, butterflies need warm temperatures in order to fly. The best times of day for viewing butterflies is between 10AM and 3PM. Butterflies shelter for the night at high points in their territory in order to catch the first rays of the morning sun. The lifespan of butterflies is fairly short. Most live a single season from egg to adulthood. The flight life of the average butterfly is 7 to 12 days. During this short span, they must find enough food daily to survive, they must hunt for a suitable mate and find safe places to lay their eggs. Butterflies have many natural enemies. Predators include spiders, mantis, dragonflies, toads, lizards, birds and small mammals. To combat these threats, butterflies have evolved defense mechanisms that include foul taste, bright warning colors, large fake eye spots on wings, and the ability to wiggle their hind wings to distract predators from attacking the butterflys more vital body parts. 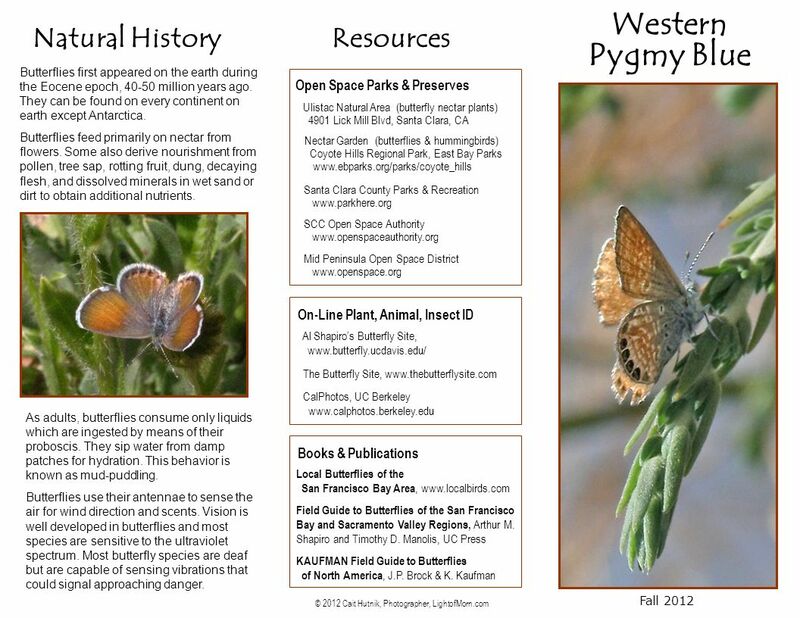 Download ppt "Western Pygmy Blue Fall 2012 Natural History Butterflies first appeared on the earth during the Eocene epoch, 40-50 million years ago. They can be found." Christopher J. and Blue C.
Butterflies Created by Melinda Frydenlund. BALTIMORE CHECKERSPOT BUTTERFLY RESTORATION PROJECT BY: LILY LE 2/22/12 SCIENCE. Facts About A Frequently Seen Bird About Town All About Those Rockin Robins. The Checkerspot butterfly Named the official Maryland State insect in 1973 Their family and subfamily is Nymphalinae Their Eggs are laid in groups of. I am a butterfly. I live among beautifully colored gardens in warm climates. I wonder where my sweet nectar lies. I hear the flutter of my wings. I. Blue Morph Butterfly in the Rainforest Angie. Introduction Tropical rainforest are really important. Tropical rainforest are located near the equator. Insects Block 1 January 13, 2015. The Secret Lives of Western Pond Turtles An interpretive introduction to Western Pond Turtles, their life cycle, habitat, and threats to their survival. Project Grade worth a total of 200 points between now and May! This is on going and must be maintained weekly! Metamorphosis: Butterflies and Moths Click on a picture to learn more about the person. Click on the home button to return back to this page. Use the.  A monarch butterfly has orange wings with black wing veins and outer margins. It has small white spots on the outer edge of the wings and three orange.